Regardless of the airline, having elite status can make travel more comfortable (and certainly less stressful). Some travelers value elite status so much, they go to great lengths to keep it and are devastated if they ever have to give it up or lose it. If you’ve flown enough to meet the status requirements of an airline’s frequent flyer program, there’s probably another airline out there that would love to have you as a loyal customer. The new airline might even offer you an incentive to try them on for size. That could be a status match or status challenge — many airlines offer some form of these opportunities for the purpose of luring existing frequent flyers. Southwest Airlines is one of several major airlines with a status match program. Delta Air Lines, United Airlines, American Airlines, Alaska Airlines, and many others have their own status matches/challenges that offer frequent flyers of other airlines a chance to experience corresponding elite benefits for a limited period of time. Southwest’s status match is complimentary and immediate on approval. They’ll also extend your elite status beyond the initial promotional period after you complete minimal additional requirements. Let’s get started reviewing everything you need to complete a status match with the Southwest Airlines Rapid Rewards Program. What Is a Status Match and How Does it Work? If you have current elite status with an airline and need (or want) to switch to a new airline, that new airline may have a program whereby they will match your status (they want your business, after all!). You would submit a request to the new airline including documentation of your current elite status and flight history. The new airline will either approve or deny your request. If you’re approved, you might receive immediate elite status for a specific period of time. You may also be required to complete additional activity before you receive the status match, depending on the airline’s policy. Note that you don’t have to give up your current elite status, nor is it transferred to the new airline. The new matched status would be in addition to your existing elite status. Each airline has its own procedure for matching airline status. The program could be an immediate status match based on your current corresponding elite status, a requirement that you complete certain activities before they grant you a status match, or a combination of the 2. Status Match With a Challenge — You receive immediate status and then are required to fly a certain amount of miles (usually in a 90-day period) to have the status extended. Status Challenge — You do not receive any status match until you complete the required qualifying activity. It is also possible that your status match request will be denied. Possible reasons for denial can include that your current airline is not eligible, your status has expired, or your status was earned by having a credit card or from a previous status match. Hot Tip: If you need more clarification, check out our piece — The Ultimate Guide to Airline Status Matches/Challenges. Southwest’s status match program grants immediate elite status when your request is approved. The airline then requires you to complete a challenge in order to extend your granted elite status for 12 months. You’ll enjoy immediate benefits as an A-List elite member when your status match request is approved. Image courtesy of Southwest Airlines. Southwest’s frequent flyer program has 3 levels of elite status opportunities. When your status match request is approved, you are granted A-List level elite status that is valid for 90 days. However, if you go on to complete the status challenge requirements, your elite status will be extended to 12 months. To extend your status, you must complete 3 paid round-trip flights or 6 paid one-way flights within the 90 day period after your status match was approved. Normally you would need to fly 25 paid one-way flights or accumulate 35,000 points in a 12-month period to secure A-List status. Southwest Rapid Rewards Points are earned through paid fares, partner purchases, and by using Southwest’s Rapid Rewards credit cards. Bottom Line: Status matches and challenges offer a fast track to elite status for completing requirements that are far less than normal annual requirements. They’re a perfect shortcut when you want (or need) to change airlines. The first step in any status match process is to join the new airline’s frequent flyer program. To join Southwest’s Rapid Rewards program, simply complete the enrollment form on their website and make note of your new membership number. Once you’ve enrolled in Rapid Rewards and secured a membership number, you’ll need to take a screenshot or secure a copy of your current elite membership credentials with the other airline. Submit your request to southwest.statusmatch@wnco.com. You can expect to receive a reply within 12 business days. If your company has a corporate travel agreement with Southwest Airlines, you may also be eligible for a status match. Submit your request to rrstatusmatch@wnco.com. Fortunately, with Southwest Airlines, you can submit a status match request at any time. Once your request is approved, your A-List status will be valid for 90 days. After you have completed the status challenge requirements within that time period, your elite status will be extended 12 months from the date of first approval. There’s no need to worry about timing your request for optimum results here. Southwest’s low fare calendar makes it easy to find affordable flights to complete your status challenge. Image courtesy of Southwest Airlines. To complete the status challenge, you must book and board the required flights within the 90-day period after your status match is approved. Reservations that were booked prior to your status match approval will not count toward the challenge. Fortunately, Southwest flights can be canceled and re-booked without additional charge. To receive A-List benefits while flying, your flights should be booked after your promotional status has been granted and your A-List status shows in your Rapid Rewards© account. These must be paid flights, and you will need either 3 round-trip journeys or 6 one-way flights to complete the challenge. Fortunately, Southwest allows you to look up fares for every day of each month with its low fare calendar. If you’re flexible you can save a lot of money on your flights using this tool. 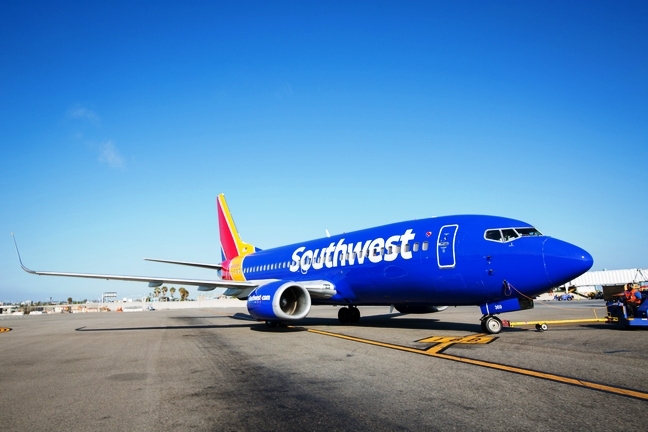 Save 20% on inflight purchases with your Southwest Airlines branded credit card. Image courtesy of Southwest Airlines. Having an airline-branded credit card delivers benefits you won’t receive with elite status alone. You’ll be earning award tickets faster, receiving discounts/credits, and enjoying additional perks/benefits. In addition to a generous sign-up bonus, the Rapid Rewards® Priority Credit Card (Learn More) will earn double points on purchases with Southwest and its partners. The card allows you to earn points you can redeem for flights and help you re-qualify for A-List status. With perks such as priority boarding, inflight discounts, and an annual travel credit, your new elite status is enhanced immensely by having the Rapid Rewards® Priority Credit Card (Learn More). Bottom Line: If you have elite status and are loyal to a particular airline, it makes sense to have their branded credit card to enhance that status with ways to earn award flights faster, receive discounts/credits, and enjoy benefits you won’t get with status alone. Current Rapid Rewards A-List members do not qualify for the status match/challenge promotions. Corporate members can complete the status challenge by obtaining 8,000 Rapid Rewards Points or completing 3 paid round-trip flights or 6 paid one-way flights. Regular members do not have the point option. If you complete the higher annual requirements for A-List status (25 one-way paid flights or 35,000 points) during the status challenge promotional period (as opposed to just the reduced challenge requirements), the annual A-List status will prevail over granted promotional status. Southwest’s status match is not always available. Currently, they’re accepting status match requests through 2018. Even if the offer is pulled, chances are that it will return as it has in the past. If you hold elite status with any domestic airline, live near an airport serviced by Southwest Airlines, and frequently fly the airline, there’s no doubt you would benefit from receiving a status match. Status matches can start you on the path to a higher elite level while allowing you to enjoy the benefits and perks you’re accustomed to with your current airline. Since status matches can be limited to once in the lifetime of your account, you’ll want to request a status match only when it serves you best. For example, when you’re ready to switch airlines, have extensive travel planned on Southwest, and can use the temporary status as a platform for achieving continued elite status with the new airline. How does Southwest's status match work? If you have elite status with another domestic airline, you can submit a request to Southwest and ask them to match you to their A-List elite status. Once you are approved, you will have status with the Southwest Rapid Rewards program for 90 days. To extend your status 12 months, complete the additional requirements of 3 paid round-trip flights or 6 paid one-way flights in that 90-day period. How long does it take to get a status match? If you submit all the requirements correctly, you should receive a response to your email request within 12 business days, and your Rapid Rewards frequent flyer account will be updated accordingly with the new status. What happens if I don't take the flights for the challenge? If you do not complete the required flights within the 90-day period after you are approved for the status match, your status will expire at the end of the 90 days. When is the best time to ask for a status match? You can submit a request for a status match with Southwest any time the status match promotion is active. Southwest does not always have a status match promotion going on, so it’s best to take advantage when there is one in progress. They do run the promotion periodically, so if you miss the current one (currently scheduled to last through 2018), you can catch the next one. Do other airlines offer status matches? Yes, several airlines offer status matches. Delta Air Lines, United Airlines, Alaska Airlines, and American Airlines are a few that have current status match/challenge programs.